In 1989, a group of graduate students exposed what they called the “Zero Club” — the 28 departments at UC Berkeley with no underrepresented minority faculty. In 2015, 20 of those 28 departments are still in existence, and despite efforts to increase diversity, 16 of the 20 still have no black or Latino faculty. Recently, both the Graduate Assembly and the ASUC have addressed this issue by passing resolutions targeting faculty diversity. With the idea of tackling the issue directly, the assembly passed a bill in April endorsing the election of graduate students to participate in the hiring process as full voting members of the faculty search committee. There are many factors that contribute to a lack of diversity and delay the efficacy of new policies, such as implicit bias, few underrepresented minorities in the application pool and slow turnover rates for tenured faculty. Numbers of underrepresented minority and women faculty continue to lag after years of campus equal-opportunity employment efforts. Proportions of underrepresented minorities and female faculty often fall behind placement goals, and even those placement goals are often far from representative of California’s demographics. Often, both black and Latino faculty are simply absent from departments or academic committees. UC Berkeley’s faculty diversity falls well behind the relative diversity of California’s population, and recent campus reports show that it also lags behind diversity in the academic job market. In 2012, there were more than 130 underrepresented minorities among UC Berkeley faculty out of 1,620 full-time faculty, or about 8 percent. Underrepresented minorities make up more than 45 percent of California’s population and continue to rise in proportion. According to census data, the California Latino population surpassed the white population in 2014. Within tenure-track faculty, underrepresented minorities are underutilized in every scientific field, according to a 2014 UC Berkeley report, which defines underutilization as “having fewer minorities or women in a particular job group than would reasonably be expected given their availability in the job market.” In other words, there are proportionally more underrepresented minorities who hold doctorates in the academic pipeline than the campus hires. Among tenured faculty, blacks and Latinos are underutilized in about half of academic fields, especially in the sciences. In the departments of economics and political science, there are no black professors. In 2014, environmental science, policy and management professor Carolyn Finney was denied tenure, sparking an online petition to reverse the decision, which the campus ultimately upheld. Sylvain, one of Finney’s graduate students, participated in a protest of the decision in May. The hiring and tenure processes are isolated from student involvement, largely controlled by committees that often have no underrepresented minorities. The campus budget committee, which makes final recommendations on all promotion and tenure cases, has had one underrepresented minority member in 25 years and currently has none, according to David Stark, director of Stiles Hall, a nonprofit community service agency affiliated with the campus. Finney believes that the tenure process, currently opaque to protect professors going through it, should be more transparent. Over the past four years, UC Berkeley’s Division of Equity and Inclusion, created in 2006, has developed an equity adviser network of one tenured professor in each department who evaluates diversity throughout the hiring process. The advisers compare diversity measures twice during any hiring process: once to check if the search pool represents demographics of available people with doctorates in the field, and once to check if the short list for hiring represents the search pool. If it does not, they ask for the search pool to be expanded. Numbers of underrepresented minority faculty have increased as a result of these measures, said Vice Chancellor of Equity and Inclusion Gibor Basri, who announced last year that he will soon be stepping down. Basri said that while percentages of black hires have mostly stayed the same in the last 20 years, underrepresented minority faculty and female faculty are granted tenure at the same rate as white or male faculty. According to Stark, underrepresented minority faculty frequently take on more mentorship responsibilities for students, leaving them with less time to publish research, because of their roles as support structures for underrepresented minority students on a largely Asian and white campus. “It can be difficult for graduate students of color to find mentors when there are few reflections of themselves in faculty,” Sylvain said. Finney says she was criticized for publishing a book written in accessible instead of purely academic language, as well as for taking on more public outreach engagements than her peers. 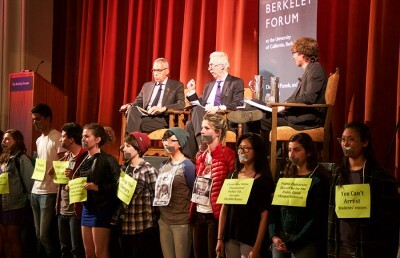 In 2013, the UC President’s Advisory Council on Campus Climate, Culture and Inclusion recommended annual transparent reporting by the campus on tenure-track hiring and promotion to senior administration, as well as key academic committee membership, citing UCLA as an example of this type of reporting. Then-UC president Mark Yudof endorsed the recommendations, which were sent to campus chancellors. 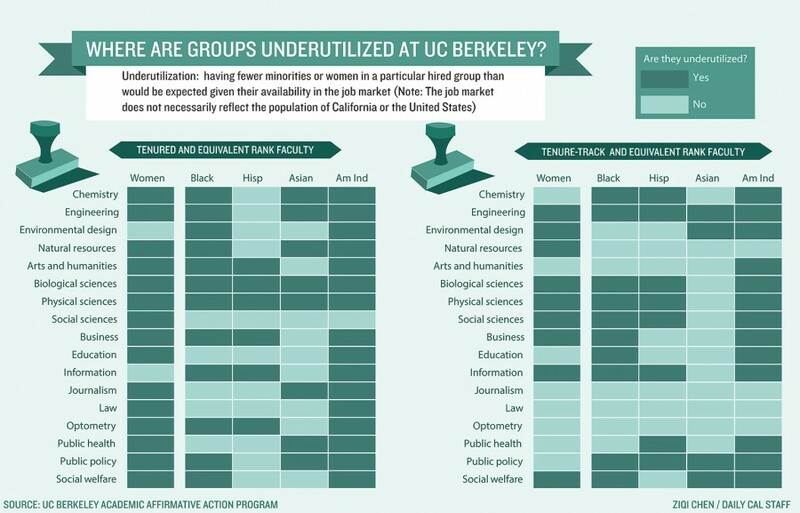 Out of 89 academic personnel committee or budget committee members on all nine UC campuses, five are underrepresented minorities. Three of those five are at UCLA. The issues that underrepresented minority and female faculty face frequently intersect. Among UC Berkeley tenured faculty, women are underutilized in every field except environmental design and information, according to a campus report, and out of the 89 UC academic personnel committee or budget committee members, only 28 are women. Basri said that significant progress has been made in the hiring of female faculty, with new hires of women at about 40 percent, but that the slow rate of faculty turnover keeps the total percentage of female faculty at about 30 percent. The campus has also implemented family-friendly policies in order to retain females with doctorates, who leave academia at a higher rate than males with doctorates. In the early 2000s, Basri said, female assistant professors had children at a significantly lower rate than their male counterparts, but since these policies have been put in place, that disparity no longer exists. But Leslie Salzinger, a campus professor of gender and women’s studies, says implicit bias continues to affect how female faculty are treated. “Jobs are gendered, meaning our ideas about what makes an authoritative lecturer … those images that we carry, are highly masculinized,” Salzinger said. Implicit bias is also well documented against underrepresented minorities, especially blacks, showing that resumes are less likely to receive an interview if they have stereotypically black names and that faculty members at universities are more likely to reply to emails with stereotypically white names. The Graduate Assembly resolution in April, authored by Sylvain and the assembly’s former internal vice president Mary Flores, aims to increase faculty diversity through the appointment of at least two elected graduate students as full voting members on the faculty search committee. The resolution doesn’t guarantee change, but it means the Graduate Assembly executive board now has support from the graduate student body to advocate to the administration at least two graduate student seats. Graduate student delegates in each department will also urge their respective departments to support the resolution, Sylvain said. 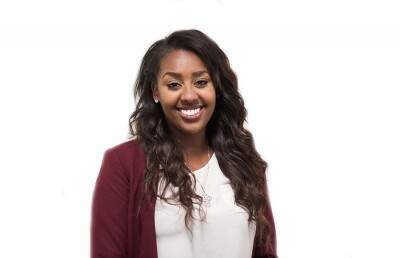 In addition, Basri said the campus will announce new diversity initiatives in the fall. Sylvain hopes graduate student representatives will challenge discrimination in faculty hiring. Contact Madeleine Pauker at [email protected] and follow her on Twitter at @powkur.